Our reviewer said it's worth it to feel more comfortable! What they say it does…..
"I suffer from arthritis in my knees and feet and usually cold feet, so suspect I may have a circulation problem too. The surgeon who performed my arthroscopy gave me his blessing, warning me not to raise my hopes. But if this device lived up to its promises, it sounded just what I’d been looking for. It works by sending gentle electrical impulses through your feet as you sit barefoot with them on the circular plate. The user manual is clear and you are in charge of the remote control, so can set the time of the session and adjust the intensity of the impulses to suit your needs. It’s a weird sensation at first, like pins and needles, but a bit of perseverance to adjust the levels pays off and it soon becomes quite relaxing as your feet rock gently and involuntarily on the plate, activated by your leg muscles. Perfect to do while reading or watching TV. Over a month’s trial, I have found my feet pinker, plumper and more flexible after a session. I left it at home for a weekend away and really missed its effects. 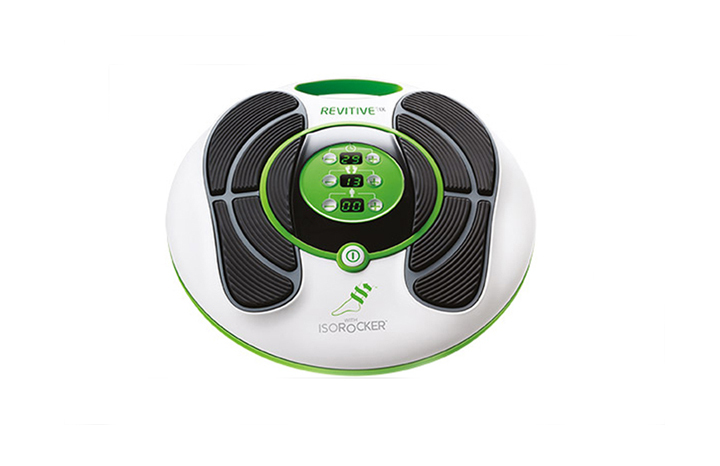 It’s great to plug in after a long walk or shop when your legs ache and has some extra gadgets so you can use it as a TENS machine on other areas of your body. Price will be a drawback for some, but shop around for substantial special offers. And you have 30 days to change your mind if you buy direct. For me, it’s worth it to feel more comfortable." Stockists include: revitive.com, Amazon, Boots and Lloydspharmacy. Ask a doctor before use. This is a medical device and certain conditions may make you VAT-exempt. Do not use if you have a pacemaker, other ACID or blood clot (DVT).